Sometimes it's important to notice (and enjoy) the little things in life. Like this ladybug crawling on a butterfly pea plant that I stopped to photograph along Bailer Hill Road. I wanted to post an update on a few of my previous posts. The "point in time" salmon numbers? Turns out its not just a fluke, and also not just a local phenomenon here in the San Juans. The Oregonian reported today that Columbia River sockeye are unexpectedly experiencing the highest returns since 1955. Some runs are 25 times larger than the average over the last decade, and some fish are amazingly traveling more than 450 miles and over eight dams to reach spawning grounds in Idaho. While celebration is in order (these fish are showing the survival capabilities that have allowed them to thrive in the northwest over the last 10,000 years), the news has also immediately sparked a political debate about why these runs have been so successful. While some cite improved ocean conditions, others jump on the fact that Judge Redden (see the "Dam It" post) ordered increased water flow over the dams when these particular adult salmon were smolts. It will be interesting to see if these runs aid the salmon's cause in current court trials. As for my intuitions on rhinoceros auklets, the news isn't as great. Last night I attended Joe Gaydo's lecture at The Whale Museum, and he indicated that the common feeling is that rhino auklet numbers are down. Coincidentally, this was the one species he wasn't able to provide historic data for, since that data "went missing" with one researcher's retirement. I will post more facts and thoughts from Dr. Gaydos' lecture in the near future. Last night I saw an amazing concert by the California Guitar Trio at the San Juan Community Theater. Three musicians on acoustic guitars (one from the US, one from Belgium, and one from Japan) demonstrated their truly remarkable craftsmanship, which included a song in the circulation form, where "the notes of the melody are divided into three parts, with each player playing every third note in precisely the right time and tempo". What, you may ask, does this have to do with wildlife in the San Juans? First of all, one of my favorite songs they played, an original piece called "The Marsh", reminded me of this photo I took a week or so ago along Westside Road. It also re-emphasized for me how powerful music and the natural world can be when coupled together. One of my projects (this winter, if not sooner) is going to be working with my boyfriend to record an original music track to the orca video I put together several years ago. He's going to compose some acoustic guitar and keyboard to go with the footage, which I'll compile digitally. The concert really inspired me to make this project happen. Additionally, one of the band members was talking about playing a private concert earlier in the afternoon near Eagle Cove, where he was truly moved by the landscapes and seascapes in front of him while he played. He said one song will be forever changed for him because the orcas came by while they played it. While they usually play a concert in a different city every night, their touring agency recommended staying an extra day in the San Juans, since so many other musicians wanted extra time here. He was glad they'd have today to tour the island a bit more. "You guys are truly lucky to live here," he said. He's right. I decided to look at some test catch data from the Pacific Salmon Commission to get an idea of how our local runs are doing. As a scientist, it's important to look at data over a long period of time to get an accurate picture of what's going on. 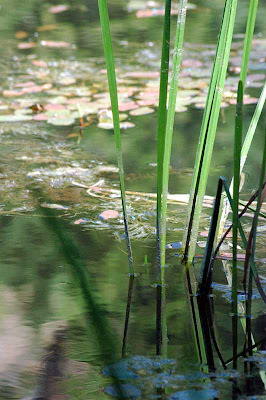 The natural world is a flexible place full of fluctuations that a single snapshot won't capture. Still, sometimes looking at a single data point over several consecutive years can be interesting in its own right. *It's important to note effort when doing something like a test catch because the amount of time you put in is obviously going to influence the number of fish you catch. If you fish for an hour, you'll obviously be likely to catch more than if you fish for ten minutes. Without going into detail of how they calculate effort, it gives you a rough idea for comparison. Take from this what you will, but I notice a few things. First of all, there are more sockeye this year than there have been since 2000, which is especially surprising since they predicted an extremely low return this year after a low spawning turn out in 2005. Also, they never catch that many chinook - yet the whales are here anyway, year after year, feeding on them almost exclusively (research suggests). 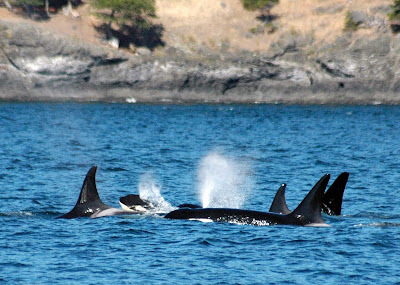 This afternoon on the Western Prince we again caught up with the 9 members of J-Pod on the west side of San Juan Island. At first they were right along the rocks, spread out and taking long dives. But before we left, they pulled offshore and moved into two tight groups. The above photo is a "family portrait" of the J16s. From left to right the dorsal fins are Slick (J16), J42 (a one year old to be named next month! 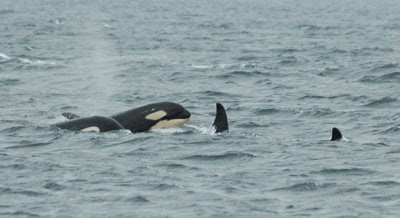 ), Alkai (J36), Keet (J33), and Mike (J26). What a beautiful pass they gave us! Another interesting sighting occurred just as we were pulling back in to Friday Harbor - an adult bald eagle chasing an osprey! The aerial acrobatics were amazing, and equally impressive was how small the osprey looked compared to the eagle. With all the whales in the area split up into several groups, we never know what's going to happen next. As we always say on the Western Prince, as soon as we think we've figured out their pattern, they throw a wrench into it and do something completely different. The last few days have been no exception. For instance, that large group of Ls I posted about seeing yesterday somehow disappeared between the morning and the afternoon. In the afternoon, boats were seemingly following the same group of whales, but only had part of J-Pod, and Ls were no where to be found. This morning, a large group of Ls was seen heading west out the Strait of Juan de Fuca so they must have still been around somewhere nearby yesterday afternoon - I still think it's so cool that ~30 whales can completely disappear in an area where lots of boats are looking for them. Speaking of "part of J-Pod", J-Pod hardly ever splits up! Last year for one day the J16 subgroup separated from everyone else for the rest of the day, but this group of Js has been apart from the others for three days now. On this morning's trip, I got to take a look at them as this group myself as they were heading in from the west towards False Bay on San Juan Island. It looks like all the J16s are involved again, also with the J14s, and an older female, J8, all together totaling 9 whales. It was my first good look of the season at Riptide, J30, who's dorsal fin is huge! It's cool to see since over the years I've been watching him grow from the 3' dorsal fin of a juvenile up to his fully adult 6' fin now. The above photo is of the J14 family group two years ago. Riptide is the tallest fin on the left - his fin has probably grown between one and two feet taller since then! When we left, the whales were heading north, and the amazing thing is that we heard that the rest of Js had split off from Ks and the other Ls to head down Boundary Pass to meet them! What I want to know is - how did they know where to swim to meet up with the other Js? Direct communication seems unlikely with all those miles and several islands between them. Did they decide three days ago when they split up when and where to meet again? It's yet another one of those mysteries that these marvelous animals keep secret. UPDATE 7/20 AM - I guess all the whales came down Boundary Pass, but the northern Js turned and went north again before meeting up with the rest of their pod! My goofy theory is that J8, Spieden, has decided she's waited long enough to take over a leadership role from J2, Granny, so she's rebelling and taking the J14s and J16s with her! 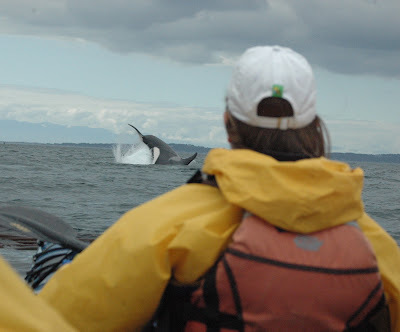 I had heard rumors that the missing L-Pod whales discussed a few posts ago had been seen in the west end of the Strait of Juan de Fuca (hence no panic as to their well-being), but simply had not been "in" to the San Juans yet this year. Yesterday, I heard a large group of Ls had come in, but they met up with Js and Ks in the middle of the straits and I feared that they were all going to go "out" for the third Thursday night in a row. That all changed this morning. I was on-call for work, and got the call to come hop on the boat. We headed north, since we had heard that all the whales (for the first time this summer, all 87 whales together again!) had headed up that way late last night. The first report was of Js at the coal docks heading north - far away and heading the wrong direction. Then a call about whales maybe seen at Lummi Island, so we checked out some harbor seals and bald eagles off in that direction. Then - yes! Whales coming south down Bellingham Channel. It took us 90 minutes to get there, but we got to see a large group of L-Pod off the south end of Cypress Island. It's so nice to see all those young adult male's tall dorsal fins out there again. All the whales were active with lots of cartwheels, tail slaps, and a few breaches for good measure - hopefully a sign they're getting enough to eat if they can be that exuberant! The closest group we got to parallel was none other that L74 and the L54s - some of the "missing links", so I got my confirmation that they are indeed back. 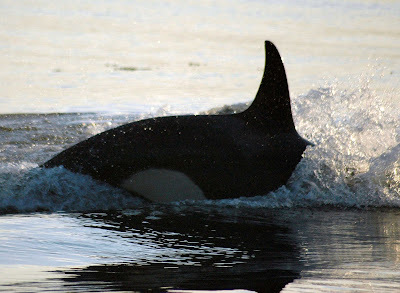 The above photo of L100 (a member of the L54s) was taken last summer off Lime Kiln Lighthouse. It was unusual to see that family group so close to shore, as they are often out in the ocean more than some of the other Ls. I was always confused if it was the mule deer or the Columbian black-tailed deer that inhabited the islands, and it turns out the answer is: both. The black-tailed deer are a subspecies of the mule deer, named for their huge ears. An interesting fact about the island deer is that they are native inhabitants, swimming here from the mainland. Occasionally you can still see them swimming between the channels, and I've seen them on small islands off the coast where the only way they could get there is by swimming. Personally, I think this means we can call them another one of our native marine mammal species, but so far that hasn't caught on. This young buck was down at American Camp, still hanging out with what was probably his twin yearling brother. Rhinoceros auklets, named for the horn-like growth on their beaks during the breeding season, are one of the most common sea birds in the San Juan Islands. We often see them bobbing in front of the lighthouse before sunset, small silvery fish dangling out of its beak. The rhinoceros auklet (affectionately called "rhinos") is able to hold multiple fish in its beak and still dive for more by using its spiny tongue to press the fish to the roof of its mouth. The above photo of an auklet was taken last October, but you can still see where the "horn" would be on its beak while in its breeding plumage. 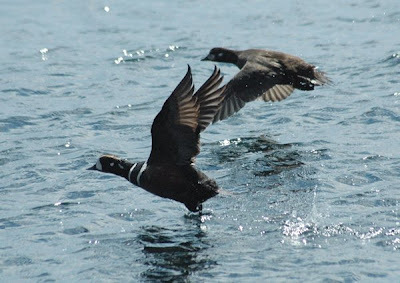 While I've seen some auklets this summer on whale-watching trips, it seemed like they were much less plentiful than usual, so I posed to the question to my fellow naturalist Captain Pete to see what he thought. We often ponder wonders of the natural world together, but he hadn't personally noted anything different in the auklet population. Still, his curiosity piqued, he put in a phone call to a few of his friends to see what they thought. One of the caretakers of Yellow Island Preserve does some informal surveys of seabirds flying by early in the morning. On a recent morning, he counted 700, which he felt was low, but he didn't have any historical counts at hand. 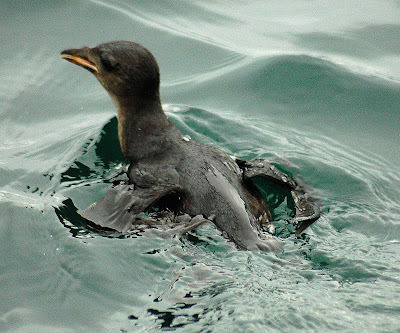 Additionally, the leader of the marbled murrelet population survey team said on a recent count they counted 1000 auklets, compared to 2000 last year. Hopefully its just a natural fluctuation in the population, and not part of the climate change related sea bird declines that have been prevalent in the Pacific Northwest over the past several years. Now that a few people around the islands have been alerted to my casual observation, maybe those doing bird surveys will take a closer look. I'll post an update if I hear any more updated data. I recently saw a headline indicating that the issue of salmon management on the Columbia River is heading back to federal courts for the fifth time. 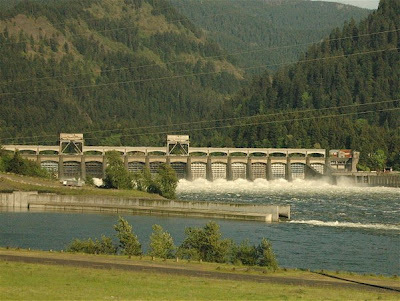 Despite reading and re-reading several articles, I haven't been able to sort out the political mess the issue has become, but the bottom line is government isn't coming up with a satisfactory solution for the main problem facing the Columbia's salmon: hydroelectric dams. Surprisingly , the Bush administration's argument that the dams have been in place so long they're part of the base environment so the government doesn't have to worry about them isn't holding up in court. In the meantime, efforts to barge salmon smolts around the dams so they can reach the ocean are having similar ineffectiveness, as they've basically been billion dollar catastrophes that don't bring back any salmon. Regardless of how much salmon habitat you restore or how much you limit fishing (both Oregon and California will not have a commercial or recreational salmon fishing season this year), the salmon populations will not rebound unless there are clear routes between their spawning grounds and the ocean. To save the salmon, some of the dams will have to go. When salmon are returning from the ocean, the first dam they encounter is the Bonneville Dam, shown in the above photo which I took from a train on the Washington side of the river. What, you may ask, do Columbia River salmon have to do with San Juan Island killer whales? The answer is actually "quite a lot". Some Oregon and even California salmon spend part of their adult life in Puget Sound and the Salish Sea, where the whales can encounter them during the summer and fall months. Additionally, during the winter when the orcas travel further south along the west coast, Columbia River salmon probably make up an even larger portion of their diet. Where is all this courtroom drama going to get the salmon? Unclear, but we may be headed towards even greater theatrics as the U.S. District Judge James Redden is threatening to have the courts take control of the federal hydroelectric dam system if the government can't bring a real recovery plan to the table. There's no set standard for how this would occur or what all it would entail (likely an independent management panel), but something similar was done for spotted owl controversy (loggers vs. owls in Northwest forests) in the 1990s. 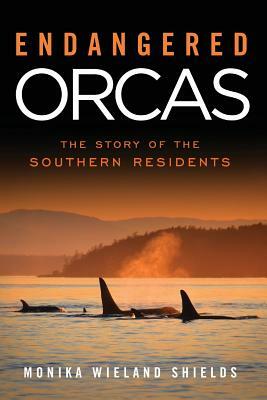 I just finished reading Neptune's Ark: From Ichthyosaurs to Orcas by David Rains Wallace. In this book, Wallace follows the evolution of life as it adapts to land, and then as it returns to the sea in the form of marine mammals. Artfully combining personal observations with descriptions of fossil evidence and stories of the quirky scientists who discovered them, Wallace discusses current theories about ancestors for all extant marine mammals, including sea lions, seals, walruses, baleen whales, toothed whales and dolphins, sirenians, otters, and the polar bear. Focusing primarily on the west coast of North America, he also discusses other marine mammals that had their heyday here millions of years ago, such as the oyster eating bear-like creature Kolponomos, or Enaliarctos, the earliest known pinniped that perplexes scientists by creating an evolutionary gap before the next pinniped in the fossil record. The narrative is bookended by examining the mysterious narrative of the otherwise reliable naturalist Georg Wilhelm Steller (after whom the Steller sea lion is named), who described in detail observations of a "sea ape" in the eastern north Pacific that have never been substantiated by modern science. An engaging read, this was the first book I've ever read where as soon as I finished the last page, I wanted to flip back to page 1 and start all over again, since it contains so much thought-provoking information I couldn't absorb it all the first time. The above picture is of course one of our current marine mammal inhabitants of the west coast, K12. Orcas are a relative newcomer on the evolutionary scene, even in terms of other cetaceans. According to Wallace, orcas may have displaced belugas and other toothed whales from the more temperate regions of the Pacific during the Pliocene. It has long been believed that a smooth surface makes the best air foil, so the bumpy front edge of humpback whale pectoral fins seemed remarkably inefficient. In the latest example of using "animal architecture" to inspire human technological innovations, Frank Fish of West Chester University in Pennsylvania has studied the mechanics of the humpback whale fin and applied the shape to the blades of wind turbines. It turns out the bumps on the fin help decrease drag in certain instances, which probably gives the whale more efficiency in making tight turns while it condenses schooling fish like herring. The results are being applied to create a more efficient source of wind energy via Whale Power, Fish's start-up company with the clever tagline "Building the energy future on millions of years of field tests". For instance, the first wind tunnel experiments on traditional air foils had a stall angle of 16 degrees. Using Fish's newly designed turbines, they don't experience stall until 31 degrees. This new technology will hopefully revolutionize the efficiency of generating wind power, and could conceivably eventually be applied to all blades such as those in ceiling fans, decreasing their power consumption. 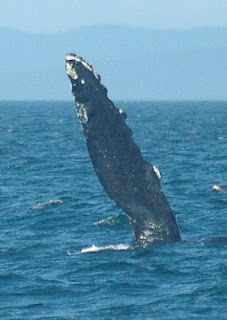 The above photo of a humpback whale pectoral fin was taken last summer in the Strait of Juan de Fuca. 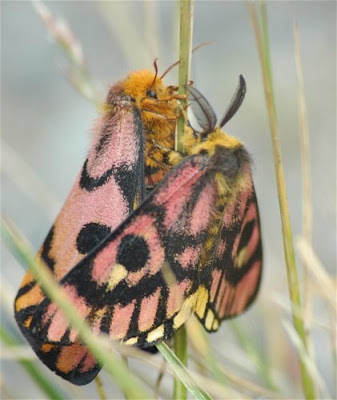 I photographed this beautiful pair of moths at American Camp, and after finding this handy butterfly and moth ID Guide on Flickr determined that they are Western Sheepmoths. Apparently, they have a two year developmental life cycle (one year as a caterpillar, and an overwintering period as a cocoon) that culminates in a single day as adults emerge in early morning and reproduce in the afternoon (which is what I assume is going on here). I feel amazingly lucky to have captured such a striking and such a fleeting moth. This summer it seems like there are bald eagles everywhere. On some of the whale-watching trips I've worked, we've seen more than 20 eagles on a trip - by far a record-setting high. There are a lot of both juveniles and adults, but interestingly enough, it also seems like many of the eagles nests are *not* active this year. Maybe the population needs to balance out a little bit. It's been a year now since the bald eagle was successfully de-listed from the Endangered Species Act, and its awesome to see the local population thriving. 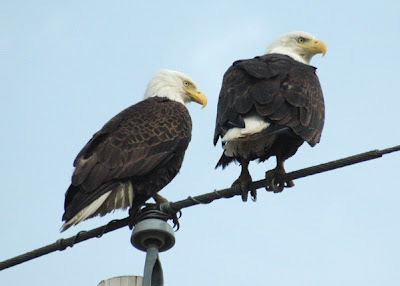 This pair of eagles were perched along Bailer Hill Road, where I often see them either on the power poles or in a nearby tree. 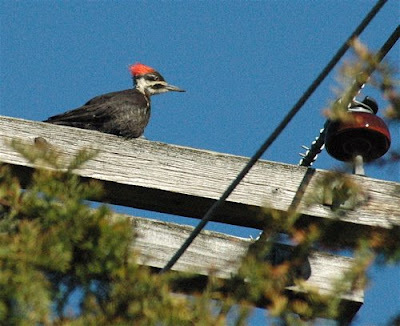 After heading out to the Pacific the evening of July 3rd, the Southern Residents hadn't been seen for several days. Often, someone will pick them up on their way back in from the ocean, so it was a surprise this morning when Js, Ks, and some Ls were picked up off the west side of San Juan Island. As you can see from the above photo taken at Lime Kiln Lighthouse, they were still around at sunset. This whale spyhopped as K-Pod members made their way quickly south, leaving Js and L7, L53, and L57 to head north. While I worked on the boat this afternoon, I also got my first good look at the K-Pod baby, currently the youngest whale in this community. It's high time I begin a public blog! For starters, this is where I can post photos and wildlife sightings to share with friends and family. 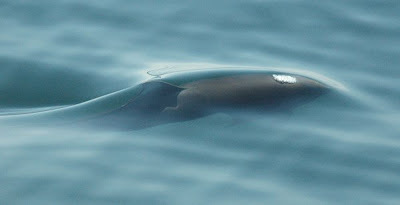 Here are a couple of photos of a Dall's porpoise I took off the Western Prince. During the last week or so we have had a lot of "players", or porpoises bow-riding on the boat. 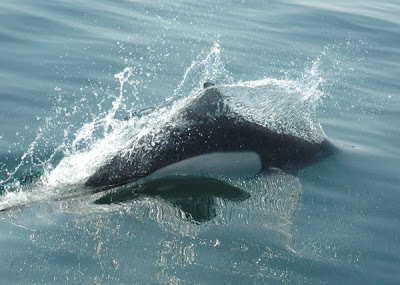 They're an awesome black-and-white porpoise about 6-8 feet long, and are famous for being the fastest marine mammal in the ocean. The first photo is my favorite "artsy" shot, of a porpoise just coming to the surface. You can see bubbles above its blowhole as it begins to exhale underwater. The second shot shows you a porpoise kicking up a "rooster tail", or a splash behind him while speed swimming. I love this picture because you can see its eye!